I had the rare occasion to marvel at the art in my coffee cup! You might already have had a cup of latte with latte art on it without realising it. Latte Art is usually a pattern made on espresso with milk. It's apparently quite difficult to make, since the conditions of the espresso and the milk have to be 'just right'. I've seen it before, in the shape of little swivels and hearts, in Europe. Now Cafe ChocoTea in Saitama is taking it to a whole new level. After pouring the shapes and swivels on the latte, the owner then draws complete, cute and detailed pictures on top of the latte! As you can see he puts a lot of effort into detailed little pictures. The picture he is drawing above, was for another customer, and it was Halloween themed. It does take a couple of minutes to get done, but that's reasonable seeing the colour and detail. Cafe ChocoTea can comfortably accommodate about 8-10 people, so there should not be too much of a waiting time. When I finally got my Latte, it was the cutest thing I've ever had the pleasure to drink! It's someone wearing a bunny hat, with a ghost in his hands! It is served with two delicious cookies and a spook for those who wish to mix it before drinking, I thought it was a total waste. Actually, I first ate both biscuits while marveling at the art in my coffee cup. The colours and thickness of the art is quite delicate! The reason why I didn't find it at first, is that it is tucked away in the corner of a bakery. The reason why it caught my eye was, while on the bakery side there were normal customers - the coffee shop always seemed to be full with cute girls, wearing sweet pastel-shade clothes in the style of Liz Lisa. Having had a peek inside, the interior was very welcoming as well. The large windows let in lots of light and every little corner was decorated nicely without giving off that 'cluttered' feel that some little cafes have. On the map, customers could mark where they have come from. According to the owner, he's been to Ireland, learned Latte Art and continued to perfect it once he got back to Japan. 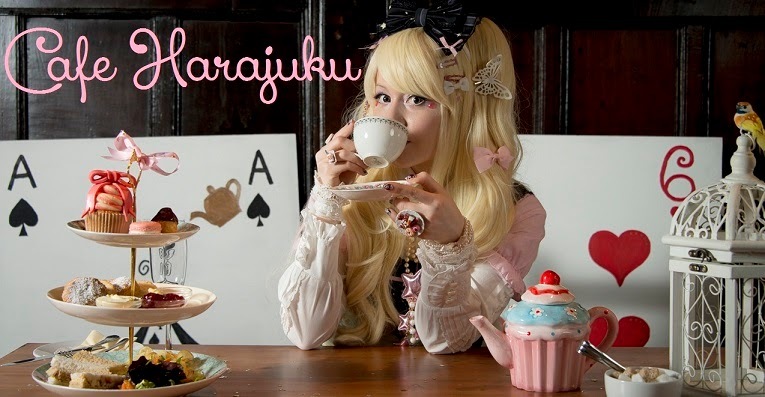 The cafe has already been on national Japanese TV and they also own a youtube channel, an Ameblo and a Facebook Page. The Facebook Page has lots of pictures and links, if you want to see more. There you can also see the Latte Art Bears, that are made out of milk foam, and look like they are taking a bath in your coffee. If you manage to find youself in the Saitama Area, looking for somewhere to impress your friends or go on a cute date, you are at the right place! I could see girls going there together, a couple and a Liz Lisa girl, who just seemed to fit right in with the atmosphere. You pay from 400-600yen for your Latte art, depending how difficult it is to make and they have cake sets and lunch menus. If you want to make sure you get the whole experience, you might want to reserve a table in advance (the table next to the counter is 'reservation-only'. Only thing I was sad about, is that I could not keep my latte art picture and had to drink it. In the end only the ears remained. I drank my art away. Yum!